The forests of Northern Eurasia are infected by vermin insects that are capable of inflicting considerable damage by weakening and killing forests. Every year, between1 and 3 million ha of forests are infected, particularly in Siberia and the Far East. Lamintria dispar, a butterfly of the Lymantriidae family, is one of the most dangerous insects and affects over 300 plant species. In Western Siberia, it occurs over more than 1 million ha (Obzor, 1995). Insect outbreaks are particularly frequent in hot, dry weather, which is typical of the continental regions. One of the worst invasions of Lamintria dispar occurred in the 1950s, when vast stone pine forests were destroyed in the Krasnoyarsk region, and in the Tomsk and Irkutsk oblasts (Obzor, 1996). 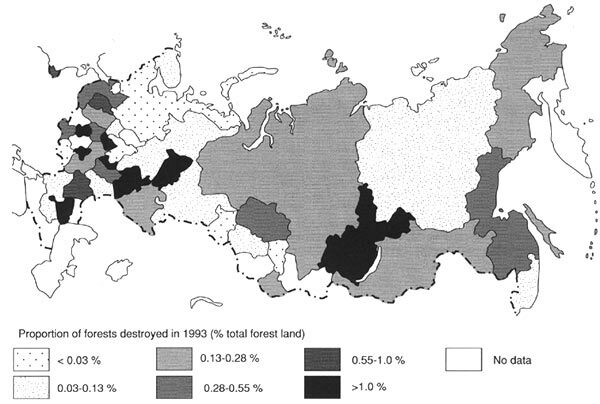 The prevailing loss of forests in Northern Eurasia is due to fires (Vakurov, 1975; Vorobiev et al, 1984; Korovin, 1995). Forest fires play an important ecological role in forest ecosystems, preventing the build-up of dead organic matter. However, they can also devastate large areas of forests (Figures 23.3 and 23.4), destroying wildlife and causing the release of large quantities of carbon to the atmosphere. 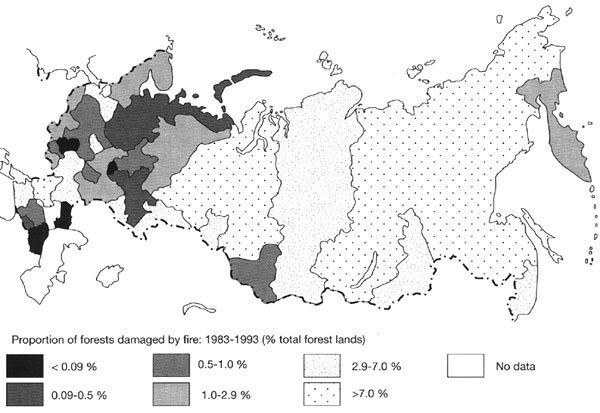 Dixon and Krankina (1993) estimated that between 1971 and 1991, between 15 000 and 25 000 forest fires were registered annually in Russia and areas damaged by wildfires varied between 1400 and 10 000 ha. On average, 2.5 million ha of forests are destroyed or damaged annually. This is equal to the area of forest fires in Canada (Kurz et al., 1992), although the total forested area in the FSU is three times greater than in Canada. The occurrence and scale of wildfires varies between years depending on weather and stand conditions and in individual years forest fires can occur on a very large scale. For example, in 1988 and 1989, fires destroyed over 1.3 million ha in the Tyumen oblast alone (Serebryanny and Zamotaev, 1997b). Fires can occur naturally, but very frequently they are a result of negligence. Scientific expeditions, prospecting parties, and hiking groups enjoy a poor reputation with forest-protecting organizations because campfires often initiate forest fires. Most often, forest fires originate close to settlements, particularly in the timber-cutting regions. On a number of occasions, protected areas were damaged, most frequently the Altay nature reserve in Southern Siberia and the Komsomolsk nature reserve in the Khabarovsk region. It takes about a hundred years for damaged forest to recover. Thus, stone pine forests begin to bear fruit only 80-100 years after sustaining damage. After primary vegetation is destroyed by fires, aspen and alder colonize burnt-out places replacing more valuable conifers and broad-leaved species. Across as little as one-third of all areas damaged by fire, original vegetation is restored and productivity of the young stands is usually 1-2 site quality units (bonitet) lower. Measures, aimed at the reduction and prevention of catastrophic forest fires should include extensive fire monitoring, expanding areas of fire-resistant species, prescribed burning, and maintenance of fire breaks. Fire management is well established in the European territory and in the Urals, while forests of Eastern Siberia and the Far East do not receive adequate protection. At present, 18 per cent of the total forest area is covered by on-site fire monitoring, 48 per cent is observed by aircraft, and the remaining 34 per cent is not monitored (Dixon and Krankina, 1993). Given the large territories involved, forest fire control services require extensive funding. Unfortunately, similar to many other activities aimed at nature protection, forest-protecting organizations are not adequately financed. In view of global warming, fire management should become a major concern to national and regional governments. Predictions from global circulation models (GCMs) suggest that up to 30-50 per cent of the land can be affected by forest fires in Russia in the next fifty years (Dixon and Krankina, 1993).